Asian Turkey Salad is one of my favorite salads! It’s crunchy, sweet and savory all in one bite. AND it’s not filled with a bunch of non-beneficial-fat mayo. Asian Turkey Salad is a great way to use your leftover holiday turkey, however, you can always purchase a thick slice of nitrite-free organic turkey from your local deli and cut it into chunks. 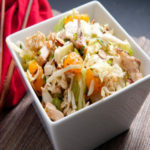 My friend Nancy shared this Asian Turkey Salad recipe with me back when I was writing my first book, Wonderfully Well. Wonderfully Well is an international favorite and I still receive comments from readers around the world about their favorite recipe. Wonderfully Well is 150 pages of our story and the cleanse that started us on our health journey in 2005. The book also contains 150 pages of healthy, “normal” recipes everyone can enjoy…even your non-healthy eater! Each recipe is marked for it’s unique nutritional traits such as GF for Gluten Free, DF for Dairy Free, NOS for Natural Sweeteners Only, HF for High Fiber and HP for High Protein and, last but not least, BF for the all important Beneficial Fats! You can pick up your copy from Amazon. After you’ve read it and used it I’d love for you to leave a review! Anyway, back to the Asian Turkey Salad. Do you love crunchy? You’ll love this! It’s perfect for winter and that “day after the holiday meal” healthy choice. I have to admit I used to love a good left over turkey sandwich smothered in mayo and mustard, topped with a sugary cranberry sauce, all in between two pieces of bread…or a left over dinner roll…HOWEVER, I know how that makes me feel so I’ve avoided that choice for many years. But this salad is THE BOMB and the reason it’s great for that after the holiday leftover meal? Celery and green onions…bet you have a few of those left! How about that dish of mandarin oranges on the counter? You’ll need at least one. And I’m sure you have some pineapple in the house, just a 1/2 cup of fresh pineapple will do (just save some now). Do you have some toasted almonds left over from your green been casserole or some cashews left from the “snack dish” on the counter? Asian Turkey Salad gets even better with Orange Ginger Vinaigrette dressing. Your family and guests will thank you and rave about this Asian Turkey Salad as your next “post holiday” left over meal. I’d love to hear how you like it! But this salad is THE BOMB and the reason it's great for that after the holiday leftover meal? Celery and green onions...bet you have a few of those left! How about that dish of mandarin oranges on the counter? You'll need at least one. And I'm sure you have some pineapple in the house, just a 1/2 cup of fresh pineapple will do (just save some now). Do you have some toasted almonds left over from your green been casserole or some cashews left from the "snack dish" on the counter? In Your Food Processor Slice cabbage, mushrooms, green onion, carrots, cucumber and celery with slicing blade. (It’s going to all go together so just push it all through if the food processor bowl will hold it all. If not, empty food processor and continue until all is sliced). Put into a large bowl. Switch food processor to S blade, no reason to clean out your food processor yet: Add cilantro and chicken or turkey and pulse to coarse chop. Add nuts, cilantro and chicken or turkey to your bowl of previously chopped veggies. Add dressing, and toss well. Top with green onions and oranges and pineapple. Celtic Sea Salt and pepper to taste, serve over greens. This will last 3 days if you store turkey and dressing separately from veggies. Add just prior to serving. Avocado would be great in this salad. Cilantro is a digestive aid; helpful after all the holiday food.